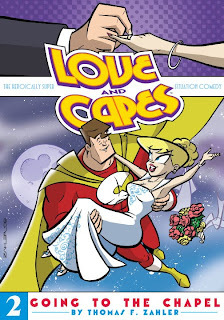 There's a nice piece with LOVE AND CAPES creator Thom Zahler up at Comic Book Resources right now. Thom talks about his plans for the big wedding issue (#12), where the book will go beyond that, the iTunes versions of the first six issues, and more. Pictured above is the cover for the second TPB, which we'll be releasing this summer.